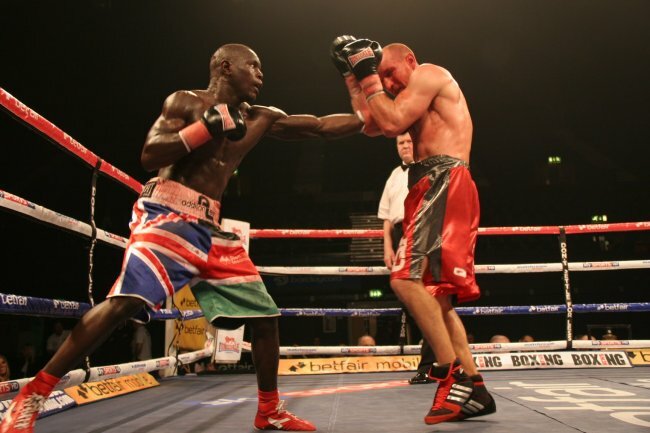 Erick "The Eagle" Ochieng continued with another successful flight again after defeating the Frenchman Frederic Serre at Wembley Arena London last Saturday March 9. The resilient Frederic Serre ( 14-7, 4 KOs ) had a tough chin but " The Eagle" using the ropes to good effect won unanimously on points to come out the clear winner in this light middleweight contest. Ochieng the Kenyan born fighter won the English Light Middleweight title last January against Nick Quigley at the York Hall in Bethnal Green London and has defended it three times. With the current British champion Brian Rose joining Ochieng at the Matchroom Boxing stable and looking to move to European and World honours. The 25 year old Ochieng and his management team led by Bryan Lawrence believe this title shot is getting closer. "I am ready for the British title whenever it comes" said Ochieng" I have defended the English title three times and I am ready to move on to the British. I want to win that, defend it and then look for bigger things. I want the British or the Commonwealth but I know I can be a World Champion, it's just a matter of time."